San Diego County Office of Education officials approved Sweetwater Union High School District’s budget Thursday, after initially rejecting it in September, but expressed concerns about the district’s ability to stay solvent in the current year. They also appointed a fiscal adviser to help guide the district out of its current financial jam. Appointing a fiscal adviser is one of the most severe steps county officials can take when a district is at risk of going bust. “The expectation with a fiscal adviser is that they will have the same access to information and financial discussions as the most upper levels of management,” Michael Simonson, assistant superintendent of business services for the county, told me. The adviser will report back to the county on whether he thinks the district is making sound financial decisions as it attempts to cut roughly $20 million from its operating costs in the current school year to stay afloat. If county officials believe the district isn’t going to stay solvent, as their letter warns is possible, they could increase the adviser’s power to be able to overturn decisions made by Sweetwater’s Board of Education. Likewise, if they believe Sweetwater’s situation is improving, they could remove the adviser. In a letter to Sweetwater, Simonson pointed to several areas of concern that could put the district at risk of default. He noted that Sweetwater’s average daily attendance – the number on which the state bases its funding formula – has dropped for five consecutive years. Nonetheless, Sweetwater’s current budget assumes its average daily attendance will increase by nearly 500 students this year. If that doesn’t happen, Sweetwater would get $5 million less from the state than it is hoping. Sweetwater currently has no padding in its budget to make up that kind of shortfall. But Jenny Salkeld, Sweetwater’s chief financial officer, told me that she is monitoring average daily attendance closely and that, at least for the moment, it is on track to increase by 500 students this year. She also noted Sweetwater has strong cash flow, which could bail the district out of a shortfall temporarily. Simonson pointed to that same strong cash flow as a cause for concern. The district’s access to cash comes from its ability to borrow money from an account dedicated to building fees, known as Mello-Roos. Since that fund is strong, the district has increasingly relied on borrowing against it to make up for shortfalls in its general fund. Simonson called this a “growing structural deficit” in his letter. Two years ago, the district had a $5 million loan balance on the money it had borrowed from Mello-Roos. Last year, that number skyrocketed to $36 million. This year, it is projected to double again to $68 million. If Sweetwater gets too far ahead on its borrowing, it could run into serious problems later. Simonson’s letter also pointed to special education costs as a line item that could throw off Sweetwater’s budget. The district currently wants to cut $2.8 million from what it had originally planned to spend this year. Some $800,000 of that will come in hiring freezes, said Salkeld. The other $2 million is supposed to come from cost savings, such as pulling children who Sweetwater had been paying to educate in private settings back into their public schools. If that $2 million doesn’t shake out, Sweetwater will go into a deficit. The areas laid out in the letter will be part of the new fiscal adviser’s focus. The county appointed Mark Skvarna, who most recently worked as a fiscal adviser in the beleaguered Montebello Unified School District near Los Angeles, to serve in the post. 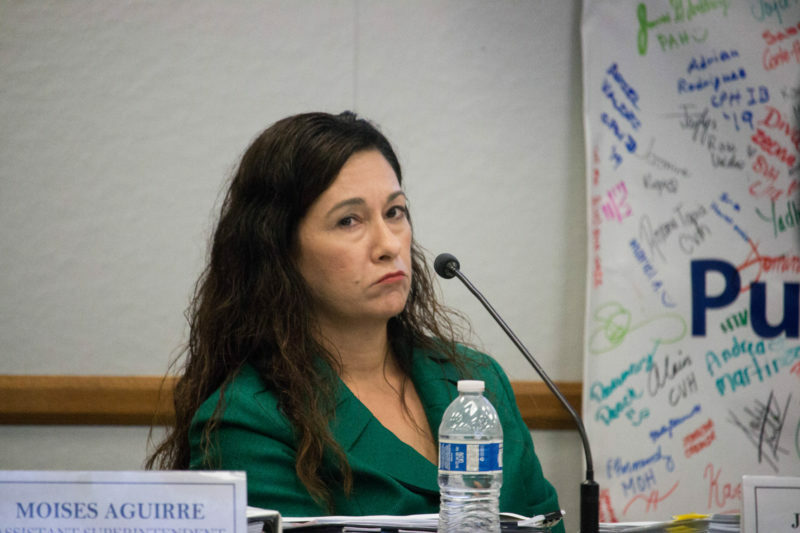 Skvarna, who also previously served as a superintendent for Baldwin Park Unified School District, had the power to overturn decisions, known as “stay or rescind,” by the Montebello Board of Education. Appointing a fiscal adviser is typically a step county officials take when a district’s budget has been rated “negative” – meaning the district is at risk of defaulting in the current school year. A lesser option involves appointing what’s called a “fiscal expert,” who has less power, when a district’s budget is rated as “qualified” – meaning it may not meet its financial obligations in later years. Salkeld, Sweetwater’s financial chief, said she was pleased to have the help. “It’s nice to have a second set of eyes to support our work,” she said.